CoolTech LLC, a med-tech startup in Baltimore, approached Key Tech with an interesting proposition; could we help them develop their new CoolStat ™ device, used to lower body temperature in patients that have stubborn, unresponsive fever? Their device would cool the patient using nothing but warm, dry air… (long pause)…wait, could you say that again? CoolTech described a cooling process that uses nothing that is cold…no refrigeration carts, no cold saline, no drugs or cooling chemicals. Needless to say, they had our attention. We took on the challenge and, working with CoolTech, we created the CoolStat. The CoolStat is a simple, portable cooling device that CoolTech is working towards approvals for use, inside and outside of the hospital, to treat things like neurogenic fever, sudden cardiac arrest, and even migraines and insomnia. Key Tech applied a full scope product development process to leverage the technology in a user centric device, specifically with FDA approval in mind. Our development work focused on creating a simple, intuitive work flow and user interface, polished through multiple formative studies with outside clinical personnel. We worked to simulate the body’s response to therapy to drive the therapeutic device requirements. The CoolStat uses a very clever and first-of-a-kind ‘phase change’ approach to remove energy from a patient, sometimes referred to as ‘evaporative cooling’. CoolTech licensed the technology out of Johns Hopkins University and completed substantial preclinical testing (in pigs) to show that it works and is safe. The evaporative process relies on a change of phase of water (saline) in the body, changing from a liquid to a gas in the upper airway and turbinates. This phase change requires energy that is pulled out of the body, with the ability to remove up to about 100 watts. The cooling process starts with a simple nasal mask on the patient’s nose. Room temperature, dry air is pumped into the patient’s nose, which then flows through the nose and out the patient’s mouth (or in one nostril and out the other). The dry airflow over the moist region of the turbinates (inside the nose) leads to the evaporative (phase change) process noted above. All very simple and safe. 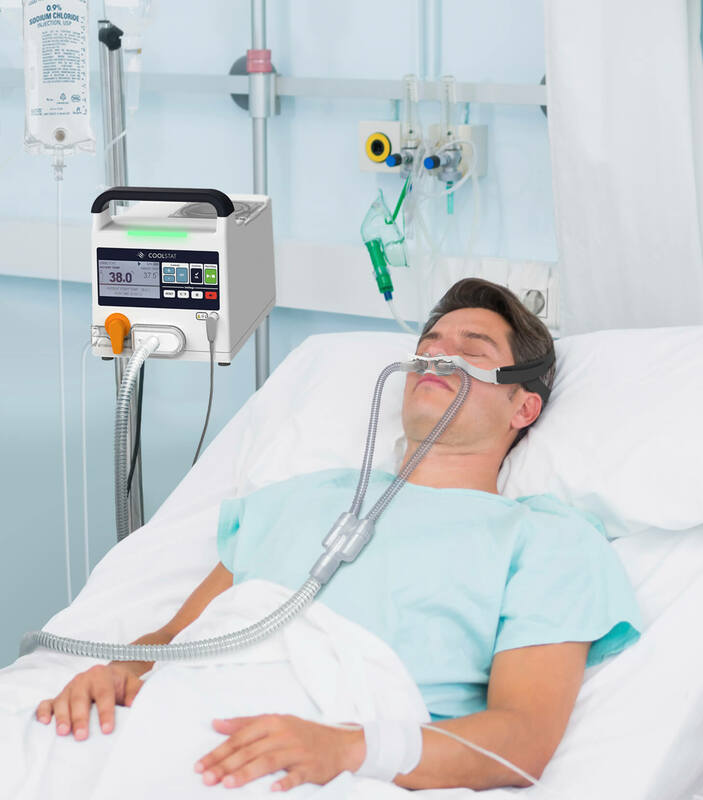 The CoolStat device (that supplies the dry air) is about the size of a large lunch box, and is mounted to an IV pole, similar to an infusion pump. This is in contrast to existing large and bulky refrigeration carts that cool patients with either large-bore intravascular catheters or whole body cooling pads. These existing systems are expensive, require a team of people to install, and can lead to a shivering response that clinicians do not like as it counteracts the cooling process. The CoolStat device was recently approved by the FDA for use in a human study to look at its ability to safely cool patients after ischemic or hemorrhagic stroke. Stroke and traumatic brain injury are events that often lead to something call neurogenic or central fever, a non-infectious source of fever in patients, which can cause damage to the brain if untreated. This study is in progress at the University of Maryland Medical System. The CoolStat device is reported to be working well, and is being used to safely cool those with fever down to normal levels. CoolTech reported that human studies so far have shown no or very little shivering response. “It is with great anticipation that we await the first iteration of approval from the FDA in early 2019 for the treatment of Neurogenic Fever. CoolStat is a revolutionary technology and the device will be a game changer in the medical field. Working with Key Tech from design to development has produced a high level of confidence in the device, and a seamless transition to marketability,” Brian Lipford, CoolTech CEO. CoolTech is preparing to run other studies in cardiac arrest, traumatic brain injury and even in migraines. The CoolStat device is CoolTech’s first product. Key Tech is continuing to help CoolTech, both to refine the CoolStat product and explore options for future products. We look forward to solving more challenges as CoolTech goes to market with CoolStat, and explores different indications for use (IFU). For insights on your next project contact us: talktous@keytech.com or 410-385-0200.